Waaay back in the day when I used to live in Alaska, the thought of surviving as a vegan was faint. This is, after all the place we decided to be at least vegetarian and that was hard enough. 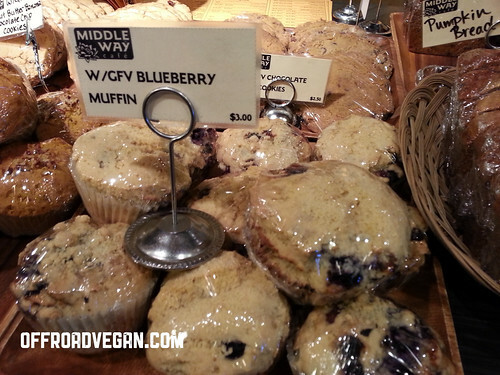 Middleway has a ton of pre-packaged vegan goodies. When I returned to Los Anchorage a few months ago (and as a vegan this time), I was really impressed with just how much easier it was. I mean, the Mooses’ Tooth lets you bring your own Daiya! One of my friends suggested I check out the Middle Way Cafe, located in a strip mall sandwiched between anchor stores REI and Title Wave Books. I was blown away by how vegan friendly they really were. And, of course I ate there every day for a week. 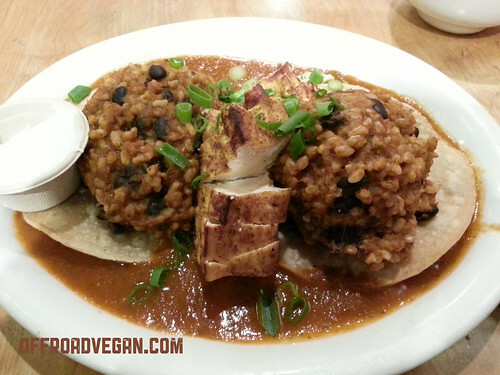 One morning for breakfast I had the Huevos Rancheros with the vegan sub for blackened tofu and vegan sour cream. It was a great meal, but needed something. Maybe some soyrizo? 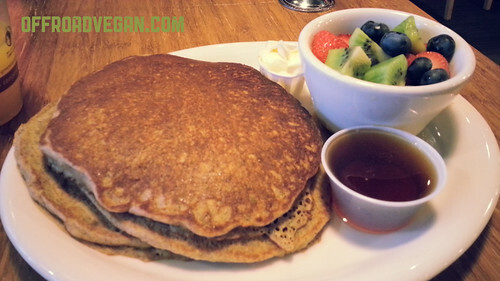 Another morning I raced over there in the sub zero temps for some VEGAN PANCAKES. Yep. They are in caps because they are awesome. Real maple syrup, vegan butter and fruit. A perfect normal breakfast. They had a ton of other vegan options including a breakfast burrito and “Colours Tofu Snack” which is described on the menu as “A crunchy patty of beets, carrots, zucchinis, and leeks on a bed of home fries and ranchero sauce topped with blackened tofu, scallions and vegan sour cream.” Never had it, but will be next on my list. I am so happy to see a place like this in Anchorage – and the fact it was been there for so long, and that the vegan options continue to grow. Previous PostTrail Report: Hell’s Revenge [Utah]Next PostAm I Really an Earth Raper?